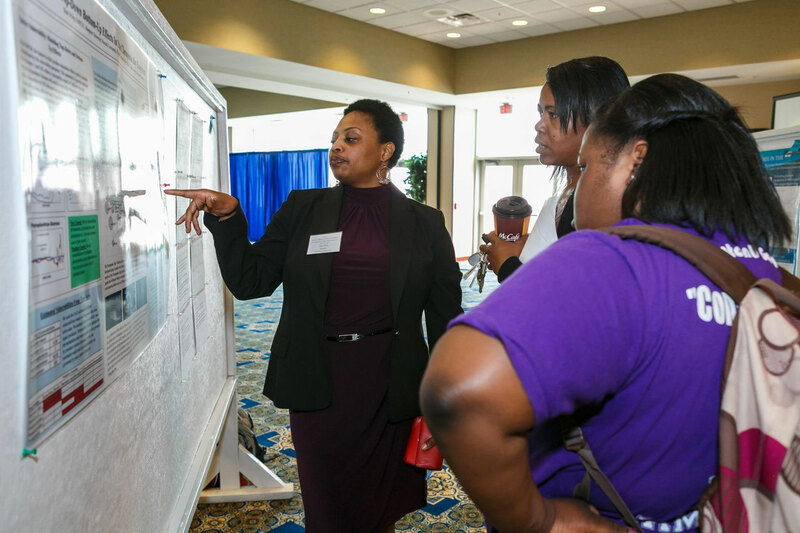 Dr. Shari Wiley engages onlookers during the 2013 School of Science Research Symposium. The faculty of the Department of Mathematics conduct world class research, provide financial support to students, and contribute to publications in the following fields: Nonlinear Dynamical Systems, Stochastic Processes, Stationary Processes, Time Series, Prediction Theory, Financial Mathematics, Harmonic and Functional Analysis, Modeling and simulation, Matroid Theory, Graph Theory, Combinatorics, Graph Entropy, Network construction, Operations research, Probability of Detection, Cryptography, Hydrodynamic stability, Approximation Theory and Mathematical Modeling of Biological Phenomena, Fourier Analysis, Functional Analysis, and Orthogonal Polynomials. Qualified graduate students are supported with full fellowships granted by funded projects. The funding to conduct research and support students come from the US Department of Energy, US Department of Education, National Science Foundation, Virginia Department of Education, State Council of Higher Education for Virginia, Army Research Office, Office of Naval Research, National Aeronautics and Space Administration, National Security Agency, Virginia Space and Grants Consortium, and several private foundations. Our undergraduate students have earned scholarships from the Department of Defense SMART (Science, Mathematics, and Research for Transformation), Howard-Hughes Medical Institute (HHMI), and the Gate's Millennium Foundation. Our undergraduates and graduates have distinguished themselves by going on to join the workforce in Fortune-500 corporations or enrolling in the nation's best graduate schools in various programs. The Department of Mathematics hosts the Center for Fusion Research and Training, where associated faculty apply nonlinear dynamics in fusion science and train undergraduate and graduate students. 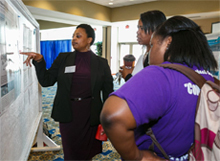 The department also hosts Hampton University's Quality Enhancement Plan (QEP). This program's main goal is to improve the student outcomes in financial literacy. In addition to getting help from faculty on one-to-one basis, the department has a students' run and grant supported mathematics tutorial laboratory. The lab is open during most of school hours to help needy students. Many faculty in the department have won various awards, including the Best Teaching Award, Endowed University Professorship, Provost Innovative Teaching Award, E. L. Hamm, Sr. Distinguished Teaching Award, Siemens Westinghouse Science and Technology Mentor Award, Who's Who among America's Teachers, and Marquis Who's Who in several categories. They have also served on leadership positions at the local and state professional societies.